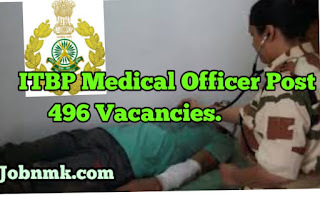 ITBP Medical Officer Post 496 Vacancies. Indo Tibetan Border Police Force (ITBP) has recently published advertisement. ITBP Invited Online Application for the Post of Medical Officers in Various Department Recruitment for 2019. Those candidates are interested they Can Read the Full Notification Before Apply online Form. Note-: The service will be at Indo- Tibetan Border or Headquarter. Candidate should hold at least M.B.B.S Degree from a recognized University or Institutions. According to the government norms. The Selection of candiate will be on the basis of PET, Written test exam marks and if needed interview. Now, let’s move on “Exams/ Recruitments” and Select thepost. Step by step Fill your own form now. Let’s Complete the Registration and Click on “Submit”. After completion of Registration, Log in with Registered Number and Password. Fill all mentioned details in the application and upload Photo, Signature etc. We hope you got proper information about ITBP Medical Officer Vacancies.